"We are not going to entertain the option of killing people." BH Tilt + Orion have released a second trailer for the horror-thriller film The Belko Experiment, which premiered at TIFF last year. Here's the concept: a corporate high-rise building is locked down and the workers are forced to play a game of "kill or be killed". Directed by Greg McLean (of Wolf Creek), written by James Gunn (of Guardians of the Galaxy), starring John Gallagher Jr, Michael Rooker, Tony Goldwyn, Adria Arjona, John C. McGinley, Melonie Diaz, Owain Yeoman, Sean Gunn, Brent Sexton, and Josh Brener. This is much better than the first trailer, and I'm still looking forward to seeing it. Going to be dark and violent and totally wicked. Have fun. You can still watch the first red band trailer for The Belko Experiment here, to see more footage from this. In a twisted social experiment, a group of 80 Americans are locked in their high-rise corporate office in Bogata, Colombia and ordered by an unknown voice coming from the company's intercom system to participate in a deadly game of kill or be killed. The Belko Experiment is directed by Australian filmmaker Greg McLean, of the horror films Wolf Creek 1 & 2, Rogue and The Darkness previously. The screenplay is written by fellow filmmaker James Gunn (writer of Dawn of the Dead, Slither, Super, Guardians of the Galaxy). The film first premiered at the Toronto Film Festival in 2016. 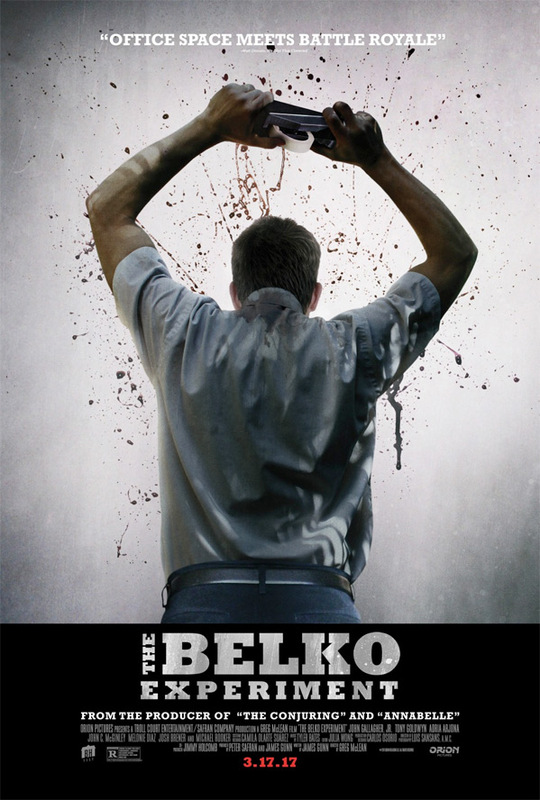 BH Tilt & High Top will release The Belko Experiment in US theaters starting March 17th, 2017 in the next few months. Planning to see this? McGinley is awesome. Not sure this will be, but it looks okay so far. Rooker and McGinley killing folks? Yes, I will have some.. Hang on, wasn't this an episode in Gotham? "From the producer of The Conjuring and Annabelle" - and I'm out. I appear to be the only one who is psyched to see another James Gunn movie with Michael Rooker and Sean Gunn (Slither, Super and Guardians of the Galaxy are some of the more entertaining films of this century)....besides, I'm sure this movie is going to be more of a dark comedy than a gory torture-porny movie.